The Power Rear Entry Dodge is one of the most popular wheelchair vans available today and has been a market leader for over 15 years. Triple S has engineered all of its power rear entry Dodge wheelchair vans with reliability and safety its number 1 priority. When building the wheelchair van, Triple S welds in to place the new lowered floor completley in place ensuring they maintain the original rigidity and strength from the factory. Offering a full power Dodge rear entry wheelchair allowing independant wheelchair users the ability to park without the fear of being parked in and will also cost thousands less than side entry wheelchair vans. With 54'' usable head room through the door, our wheelchair van conversion allows the tallest wheelchair users comfortable and safe entering and exiting from the vehicle. To learn more of what the Triple S power rear entry on the Dodge can offer, call one of our mobility team members to learn more. 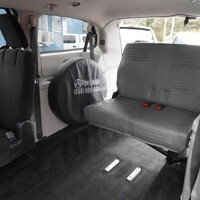 Standard on all new Power Rear Entry Dodge wheelchair vans is a 5yr/50,000 miles warranty for ultimate peace of mind. Designed to eliminate common problems with side entry conversion to offer the most reliable power rear entry Dodge wheelchair van by Triple S Mobility. Simply push the button on the remote to deploy the power ramp on the Triple S power rear entry conversion. All of our ramps are Constructed of high strength aluminum and power coated with anti-ski materials for safe traction in all climates. The ramp stows at the rear of the van below the window allowing for full visibility out all windows. The power rear entry Dodge has a lowered floor from the rear bumper, forward to just behind the driver and passenger seats. With the new lowered floor in place, taller wheelchair users will have maximum head room to maintain typical visibility while traveling down the road. When properly equipped wheelchair users can transfer to the driver seat with a 6 way transfer seat allowing for them to drive. When properly equipped, wheelchair users can transfer to the driver seat with a 6 way transfer seat allowing for them to drive. If equipped with the transfer seat, the driver seat will come reward to the 2nd row allowing for more room to transfer, when transfered, the seat will bring you up behind the steering wheel. In most case hand controls will also be need to operate the brake/acclerator. Call our mobility team members to learn more about these options and many more. In the event the wheelchair user will remain in the chair for transportation, you will need to secure the wheelchair with tie downs in four point to safely secure both the individual and wheelchair. 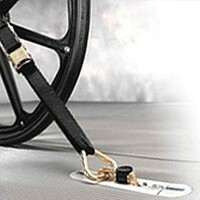 The power rear entry Dodge comes standard with L track pods capable of securing tie downs for the wheelchair. Auto-retractable tie downs come standard with all vans and we also offer power tie downs as options. No matter the style you choose, Triple S Mobility first concern is safety and a full demonstration of both proper and non-proper methods is reviewed during your research and revisited at the time of delivery.